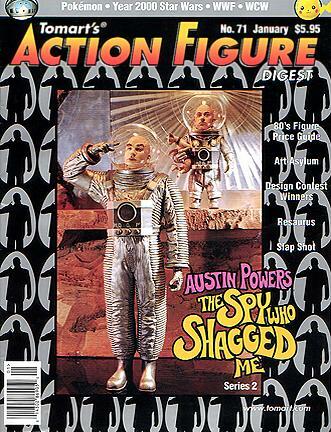 I finally found that weird ad that appeared in Action Figures Digest, #71, the January 2000 issue (it actually came out in December 1999). 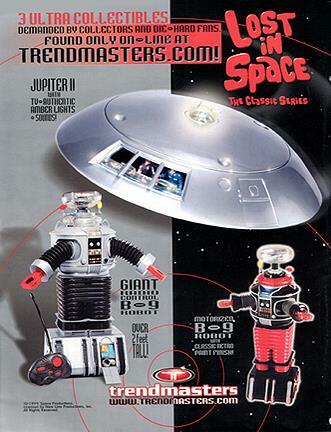 The ad is on the back cover, and I noticed that the Jupiter-2, and the 2 foot Robot are reverse images (check out the hatch on the Jupiter, and the soil door on the Robot's treads). But the weirdest thing of all, is the unusually colored 10 inch Robot in the lower right-hand corner. It was never produced! If they were going to make it, wouldn't it have made more sense to make an Anti-Matter version instead of trying to make it sort-of-appear like a Remco toy? 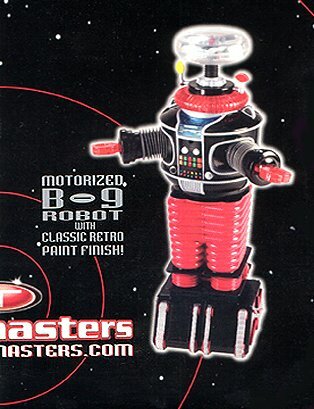 (Editor's Note) Believe it or not, Trendmasters was planning on releasing an all red Robot for every 30 Robot's per case shipped. Sadly, these Robots were never made by Trendmasters. Many thanks to, Larry Lee Moniz of Hayward California for submitting this rare info for our website!